Find out more about our famous wheels! They’re fun and easy to use. Whether for home, school, work, travel or leisure, this fascinating concept is sure to get you hooked! We’ve created wheels on a variety of subjects: from conjugating verbs to math, not to mention languages and geography. Already more than 250,000 wheels sold! Conjugating Spanish verbs has never been easier or more fun! Spin the wheel, point the arrow to a verb and see how it’s conjugated in every tense! 41 verbs Conjugation table for auxiliary verbs ser, estar and haber For an English speaker learning Spanish. An original tool to learn French vocabulary. 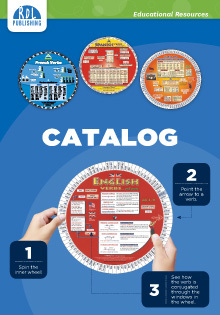 With this wheel, students can learn more than 400 basic words in French easily and quickly. Just spin the wheel, point the arrow to a noun and see its translation in the singular and plural. For a Spanish speaker learning French. Get amazing results by combining these two popular, complementary tools! 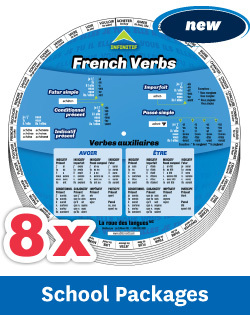 French Verbs Wheel:Conjugating verbs in French has never been so easy and as much fun! French Vocabulary Wheel:For learning more than 400 basic words in French in a flash! See a detailed description of these two products below. Get amazing results by combining these two popular, complementary tools! Spanish Verbs Wheel:Conjugating verbs in Spanish has never been so easy and as much fun! Spanish Vocabulary Wheel:For learning more than 400 basic words in Spanish in a flash! See a detailed description of these three products below. Orders are shipped within 3 to 5 business days. To check specific delivery times for your area, click here. You can reach us by email at any time or by phone from 9 am to 5 pm Monday to Friday, Montreal time. Payment can be made by credit card. Billing is also possible for schools. We’ve been publishing educational resources for more than 15 years! RDL Publishing was born in 2000 with the “Language Wheel” collection, which met with immediate success. Since then, countless new wheels have been created on a multitude of subjects, including math and geography, to name just a few. Apps have also been added to the catalogue. Today, our products are used in hundreds of schools, from elementary to university level!